As Tanzania officially starts a medal hunt campaign in Rio de Janeiro today, the athletes' hopes for success received a huge boost from the Tanzanian envoy to Brazil. The country's Acting Ambassador, Nathaniel Kaaya, visited the camp in Rio de Janeiro to motivate the athletes ahead of their tough mission, with a judoka Andrew Thomas Mlugu, to open the country's medal chase. According to the team's Physician Nassor Matuzya, the Acting Ambassador was forced to travel for 12 hours from capital Brasilia to Rio de Janeiro to see the athletes' camp. Mlugu, who, will be making a debut to the world's biggest multi-sports event, faces an experienced Australian Bensted in Rio de Janeiro The Tanzanian faces Australian Jake Bensted today in 73kg judo bout to begin the country's medal hunt in 31st Olympic Games in Rio de Janeiro. The bout is one of the 16 bouts to be held today in the Judo's round of 32 stage. Aged 20, Mlugu was born on November 12, 1995 with a height measuring 1.58 m /5' 2" -- 73 kg / 161 lbs. His Australian opponent, Bensted is aged 23 decorated with multiple Australian, Oceania Championships and Commonwealth Games medals. Like Mlugu it is his maiden entry to the Olympic Games. Bensted was introduced to the sport by his uncle at the age of six and first represented his country when he was 15. He won his first of five straight junior national titles in 2010 and claimed his first senior national title in 2012. At Commonwealth Games debut later that year, Bensted made the semi-finals before going down in a close fight with eventual gold medallist Danny Williams of England. He started the Olympic year with a fifth place finish in Tunisia and a seventh in Peru before going on to all but seal his debut Olympic appearance with a win over Gaston Lafon from French Polynesia in the final of the 2016 Oceania Championships. The country's second medal hunt will begin on Thursday when swimmer Hilal Hilal will be vying for 50m freestyle race title also in Rio de Janeiro. A day later on August 12, a young Tanzanian lady, Magdalena Moshi, will open her medal chase also in 50m freestyle at the same venue. Sarah Ramadhan, the only lady marathoner is scheduled to run on August 15, according to the event's time table. 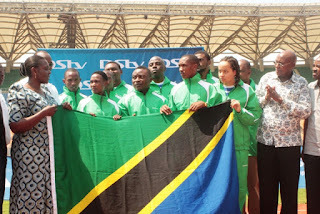 With seven athletes, Tanzania was the first nation to confirm Olympic team for Rio 2016. Four marathon runners, two swimmers and one judoka are representing the nation in Brazil. Other athletes who will represent Tanzania are: Fabiano Joseph, Saidi Juma Makula and Alphonce Felix Simbu (all men's marathon). More than 200 nations will compete at the Rio 2016 Olympic Games, with the largest teams expected to come from the USA, Brazil and China. It is estimated that there will be about 550 Americans, about 450 Brazilians and more than 380 Chinese athletes competing for medals in Rio this August. Tanzania won its only medals in 1980 Moscow Olympic Games. Both Filbert Bayi finished second behind Paul Malinowski of Finland in 3,000m steeplechase and Suleiman Nyambui who finished behind Ethiopian Mirutz Yifter in 5000m, clinched silver medals.